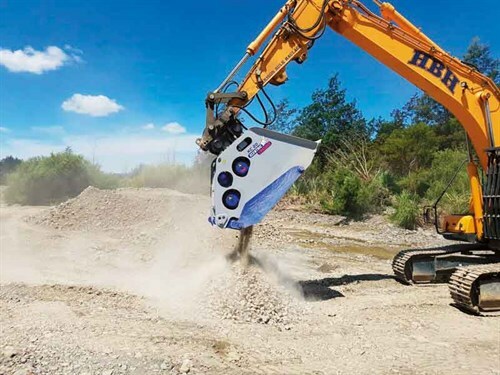 New Zealand-owned Boss Attachments provides a leading range of quality and technologically advanced attachments for New Zealand’s earthmoving, demolition, forestry, mining, and construction sectors. "We now also operate a hire division for some of our more specialised attachments," Boss Attachments MD Paul Herbison says. Among the company’s hire equipment options, its Antraquip Drum Cutter Head range has made its mark on a number of high-profile projects, including the Kaikoura Rail Tunnel rebuild. 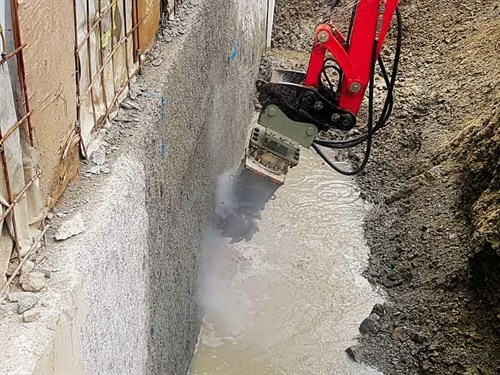 More recently, at a project in Auckland managed by demolition and asbestos removal specialists, Comex Ltd, one of Boss Attachments’ Antraquip AQ-1 hydraulic Drum Cutter Heads was used to mill back the slightly bowed concrete guide walls on what will be one of Auckland’s tallest apartment buildings. "We had it operating on an eight-tonne excavator, which suited it perfectly," Comex MD John Kendall says. "The client couldn’t believe how quickly and accurately the job was carried out." Boss Attachments says the AQ-1 is a proven compact transversional cutting head designed for small excavators and carriers. Common applications include small trench excavation as well as precise concrete cutting and profiling. It delivers an exceptional amount of power and performance when mounted on two- to eight-tonne excavators. "The reaction from clients for our Xcentric Crusher Bucket, which was introduced last year, has also been extremely positive," Paul says. Xcentric Buckets feature a patented isolating jaw movement, which ensures material is crushed without a compacting effect. This helps deliver at least 35% greater production than conventional crusher buckets. Steve Allan of Harrison Bulk Haulage is using an XC20 bucket mounted on a 20-tonne excavator to retrieve and crush river run greywacke aggregates from the Awatere River located on the East Coast, north of Gisborne. "Because every bucket load is absolutely full, we’re getting exceptional production from this Xcentric Crusher Bucket, and we’re already thinking about a second one." Xcentric Buckets have low maintenance requirements, which allows Steve to push operating hours out from the current 12 to 24. A recent analysis by a quarrying consultant indicated that the end product was the best he had seen on the East Coast." "Like all of our other brands, Antraquip and Xcentric are international leaders in their fields and they both deliver significant benefits for our clients," Paul says.